I always try to be respectful when talking about extreme weather events because of the resultant tragic effects, so I want to make sure that I’m being clear. This is a purely meteorological comparison between the Blizzard of ’93 (the original superstorm) and Sandy (the new superstorm). It’s not a comparison of the amount of damage done. 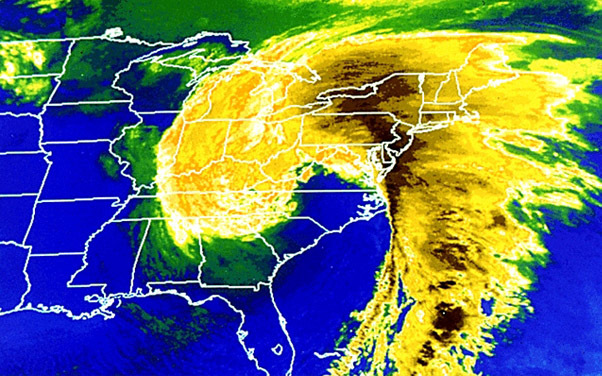 I know that the first two images are not precise matches in terms of scale (but they seem to be close) and that not all of the clouds from Sandy are shown, but the Blizzard of ’93 is clearly a competitor of Sandy’s in the competition for the largest and most impressive storm to affect the United States.